I’ve always dreamt of dedicating a wall to our amazing memories and showcasing our travels. 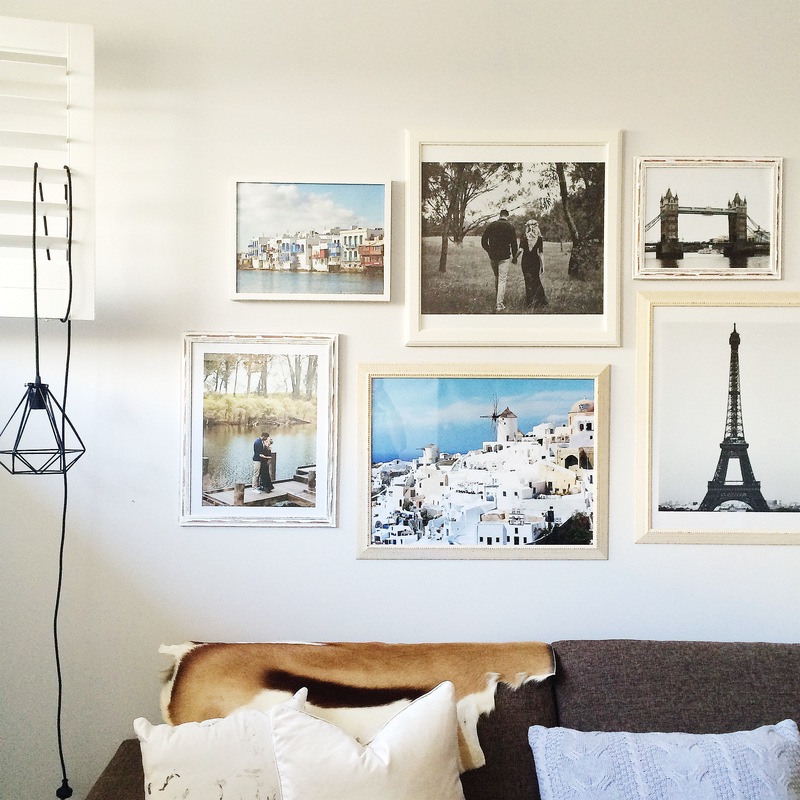 I love the idea of creating a gallery wall and being able to add to these memories as the years go by. We have styled every inch of our home and I only just realised recently that I hadn’t put out any family photos. I thought it was time that we finally put up all our memories for Ben and I to be able to reminisce over whenever we walked past. It’s time that we made this house feel more like a loved home. 1 Frames Gather frames of all sizes and textures. 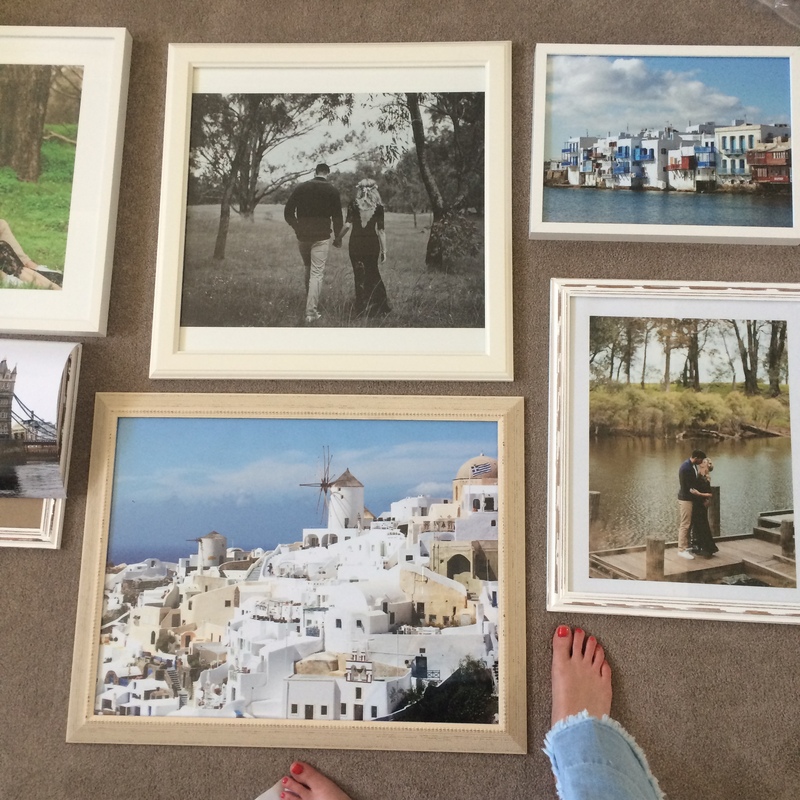 We recycled old frames from our previous house as well as combining new frames purchased from Ikea. 2 Design Lay them on the floor and move them around until you find a formation you are happy with. Take a photo on your phone of this formation so you can remember what order they go in. 3 Print Photos Write down the size of each frame and the layout so you can order your photos based on these sizes. Get your photos printed from Office Works or a place that will print them at a reasonable price as they do tend to add up. The ones I printed came to a total of $120 which I thought was rather expensive. But these photos are going to be hung for a long time so the cost is worth it. 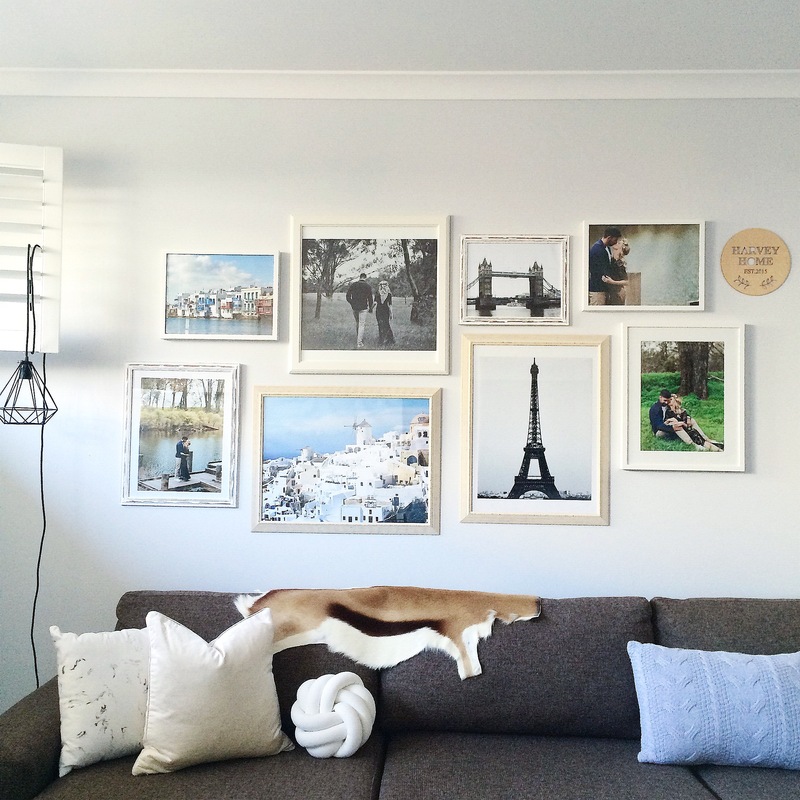 Make sure you choose prints that will go together on the wall and ensure they will all tell a story that means something to you. 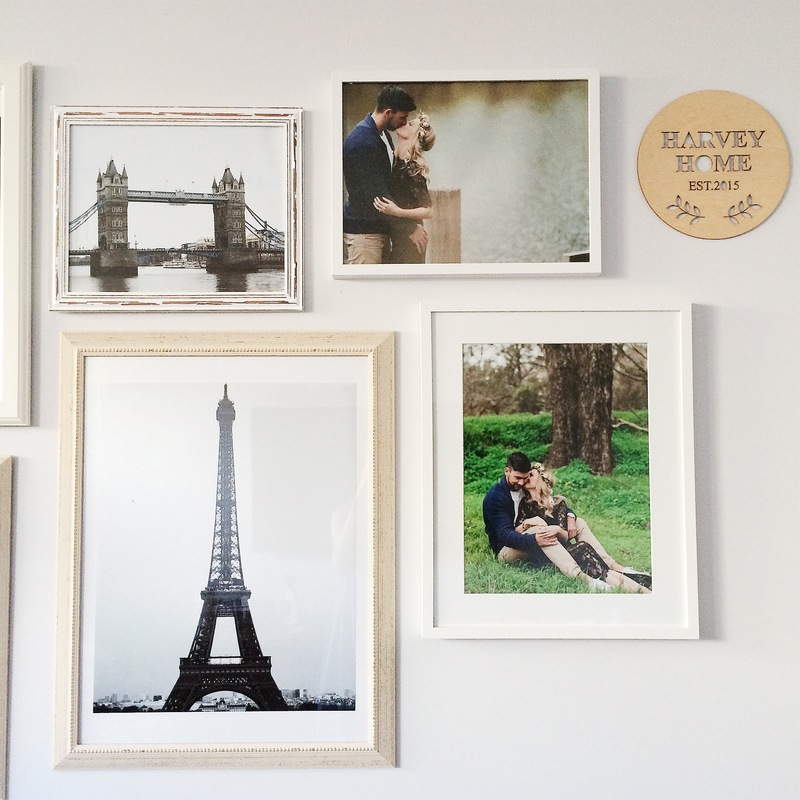 I chose a combination of travel photos and engagement shoot photos and I’ve left half of the wall to add to later on. I plan on adding our wedding photos and hopefully baby photos when the time comes. I chose to combine black and white prints with colourful ones to not make it so overpowering with colour. 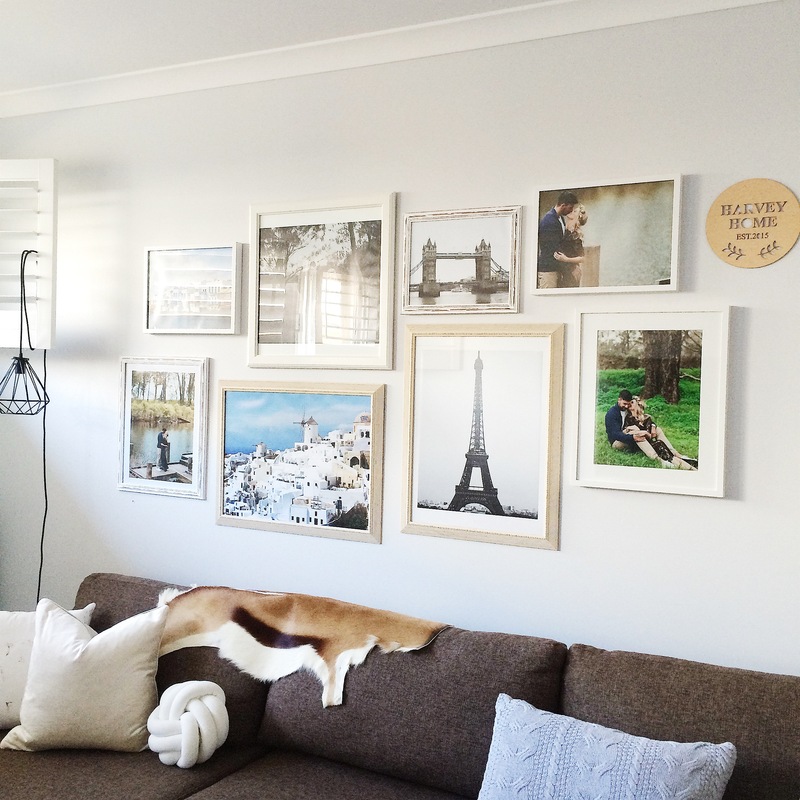 Once you have your photos printed put them into the frames and make sure they look good in this layout chosen. 4 Installation You can install these frames however suits you. Some people choose to use wall hooks, nails or sticky nails to hold each frame in place. You’ll need a drill, tape measure. hoover to clean as you go and a second person to assist. 5 Measuring Use a tape measure and decide what width you want between each frame. We chose 40mm between each side of each frame so that all the gaps were identical. Once you get the hang of the measurements, you’ll be able to determine the gap between the hook in your frame and the space required. For example: if your hook is 100mm into the middle of your frame, then you will add onto this 40mm to get the gap to a perfect distance. Once you’ve measured each gap correctly then mark this distance with a lead pencil. You can then drill your holes over this mark, and wipe clean afterwards. 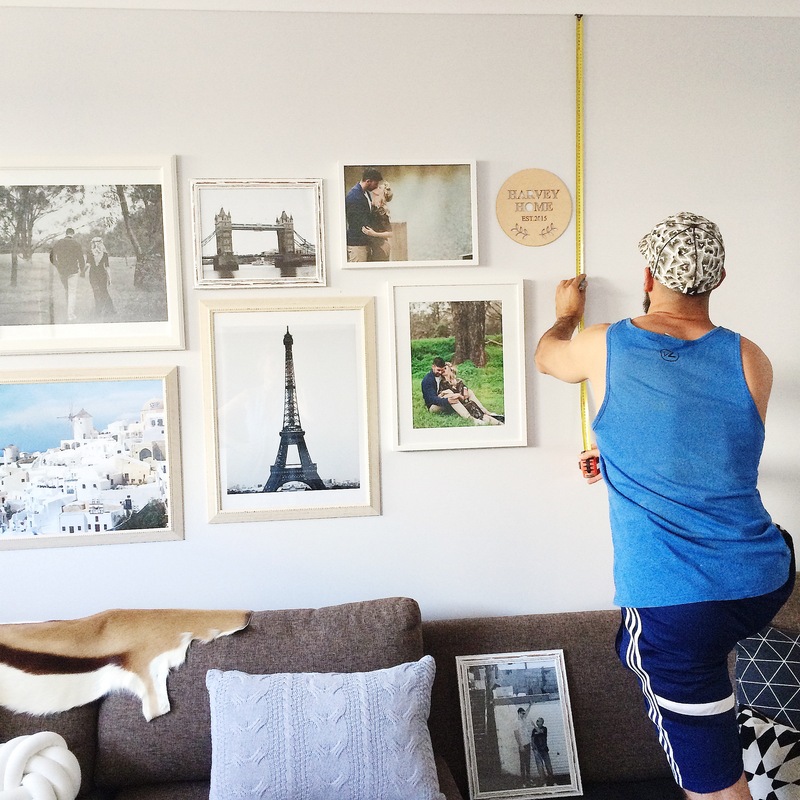 One a frame is drilled into place and hung, leave them there as a guide for your next frame. 6. Finish Stand back each time and make sure it’s coming together the way you pictured, if you need to move frames around then do this as you go along. I can’t wait to hang our future prints, this has become our new favourite room. Every time I look at these photos, memories come flooding back and bring the biggest smile to our faces. Photos aren’t magical until they are printed and hung for the world to admire.